The printer copier has changed vastly over the last several decades, there is no denying that. Many people reading this article probably remember their first ever printer which was probably a black and white dot matrix that was extremely loud. Moreover, just three decades ago, a laser printer would have set you back tens of thousands of rands. While revolutionary at the time, these devices were, by today’s standards, slow, printing two pages per second. Nowadays, a small home laser printer starts from as low as a few hundred rand. We expect them to perform optimally, whether it’s a simple home printer copier or a massive production printer, we want fast output and excellent quality prints. Although we have cloud storage available to us, people still use a great deal of paper for printing. Rather than ignoring the environmental impact and hoping futilely that the problem will go away, Xerox is constantly working on ways to help the environment and lessen our damage to it. For this reason, they are developing an inkless printer that will make use of a light of a specific wavelength that will fade after a short period of time. This will immensely reduce ink and paper used. On prototypes printed, the print will disappear within about 24 hours and the paper can then be reused several times over. 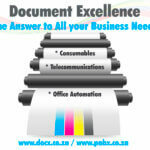 If you’re looking for modern printer copiers, look no further than DocX! We are an authorised Xerox dealer, distributing machines from the company that has consistently been ahead of the curve in the printing domain for decades.